“Integrity” has become the new conversation piece amongst organisational leaders. It is a more favourable and acceptable organisational construct than the traditional reference to “business ethics” and the often unstated assumption that ethics in business is an oxymoron. A paradigm shift is required, away from the moral philosophers’ fixation with individual character to an understanding of the science of behaviour economics; recognising that, as employees, managers and leaders, we are essentially emotional beings that can respond in irrational ways to the organisational contexts in which we find ourselves (Business Insider Australia). It starts with consciously designing the organisational context and culture to recognise that people may behave in ways they don’t mean to; that employees need to be forewarned on how they can be subconsciously manipulated by the contextual pressures they find themselves in; that managers are held to account for how they can create unconscious ‘frames’ for employees such as meeting the Wells Fargo’s impossible targets of “8 financial products per household” where job viability appeared be tied to sales targets (Forbes). It requires nothing short of redefining traditional organisational operational systems (EthicalSystems.org). The body of field research that underpins the science of behaviour ethics shows that people in general can be very poor decision makers; that we often screen out elements of the information that is supplied to us leaving us prone to decision making biases that we remain unaware of. Slippery slopes lead to “ Bounded ethicality” not just in respect to our own behaviour but also to noticing the unethical behaviour of others. So too the social phenomenon of motivated blindness contributes to our not noticing the unethical behaviour of others. The science of behaviour ethics shows us that emotions drive our behaviour; we are not as rational as we think so giving us more information will not in itself change our behaviour. Our memories of our behaviour are unreliable and we take our lead from other people who unconsciously change our behaviour. “Context” is everything in trying to make sense of human behaviour. 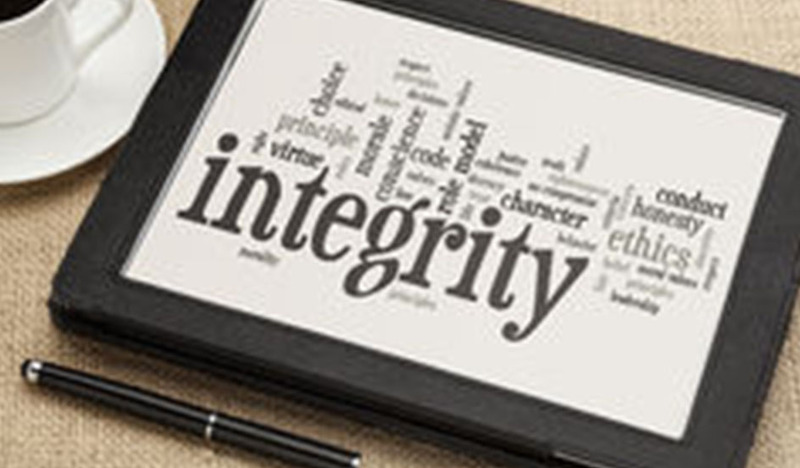 Definitions of “Integrity” too will be shaped by each business’s context but the underlying principle is that integrity in business means the ability to act with honesty and consistency of behaviour aligned to publicly stated organisational values. Many organisations today are greenfield sites when it comes to embracing the full scope of the integrity challenge because integrity begins on the inside of the organisation and can only be built on the day to day commitment to treating employees with respect and fairness. As has rhetorically been stated for many years, people are not “resources” or “numbers” to be manipulated according to share price fluctuations. Neither are they ‘human capital’ to be invested or divested at the whim of adjusting the ‘asset backing’ of the corporation. We have known for years that high trust organisations are high performing organisations and yet there are still too few organisations that leverage the full capacity of their people. The same commitment to human respect is then extending outside towards customers, suppliers and stakeholders. Neither does “integrity” commitment start in the communications department. It is set at the leadership table as leaders come to recognise that all behaviour is shaped by the social context of the organisation and that it is their responsibility to manage the internal culture so as to better respond to the changing external context. Leaders especially build organisational integrity by “holding the line” especially when the going gets tough. Ethical leadership means that the boundaries leaders set around values-based leadership, quality services, fair customer treatment, and corporate responsibility are adhered to so that their employees can feel safe knowing their leaders walk the talk. Be it in the short term, or in the long term, ultimately, it is the sum of organisational behaviours that enables or disables an organisation to achieve its strategy and business objectives. Culture drives behaviour not corporate policies. Building and maintaining a culture of integrity can only happen if leaders are committed to measuring and managing their organisational cultures as the leading organisation around the world do. Regularly measuring culture enables leaders to fine tune their policies and procedures to shape and design the organisational cultures they want. If you would like to explore further the research into behaviour ethics, we recommend EthicalSystems.org.